Cables not originally intended for use as RF feed lines are often recommended that application. Examples are power cables and telecommunications cables. I recall that as a new ham, I accepted ‘expert’ advice that Figure-8 light flex (as it is known in Australia, ZIP cord in the USA) was a good and inexpensive feed line. 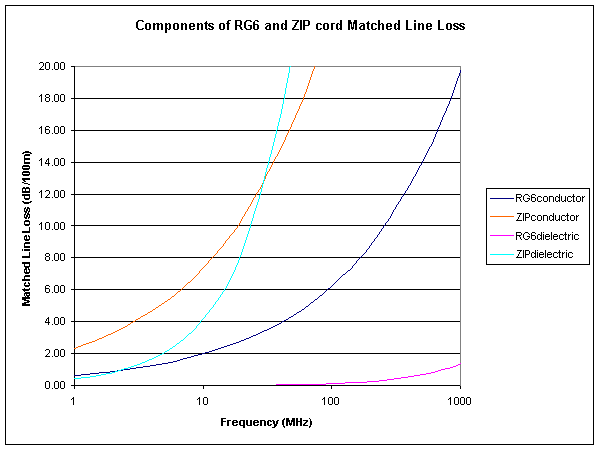 Above is a plot of the conductor and dielectric loss components of RG6 and ZIP cord (as characterised by K8ZOA). The ZIP cord is a poor transmission line because conductor losses are relatively high, and dielectric losses are much higher than quality dielectric such as polyethylene, contributing as much again to the total loss by 30MHz. To take a practical example, taking a half wave dipole at 14MHz (say feed point Z=60+j0), and 25m of ZIP feed line, the efficiency of the feed line is about 40%, whereas common inexpensive RG6 TV coax would have an efficiency of around 87%. If there is a substantial amount of PVC immersed in the electric field, losses may be much worse than imagined.